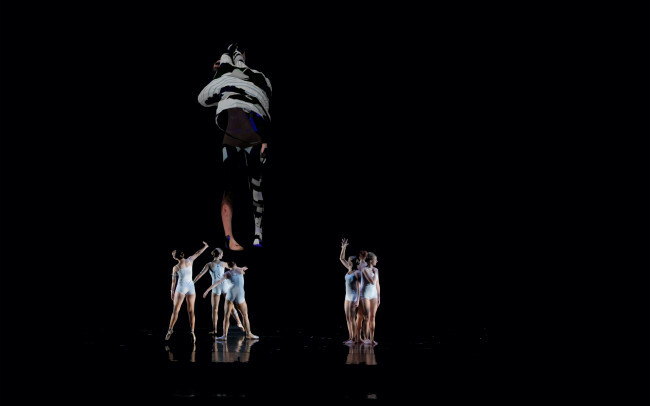 human, next is a collaborative multimedia project by choreographer James Moreno and artist Benjamin Rosenthal that uses dancers, video projections and mobile monitors to perform the convergences and differences between virtual and physical bodies—offering new perspectives on our 21st century hybrid condition. 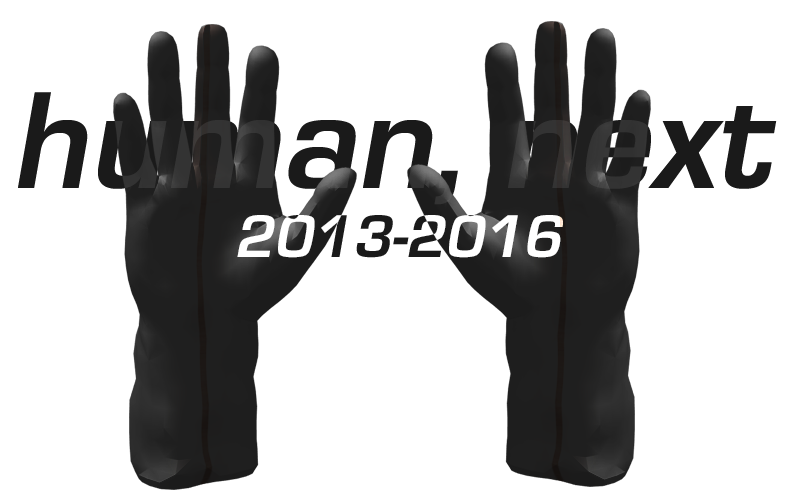 The project incorporates three phases of live performances, as well as video reinterpretations that exist as independent single-channel works. 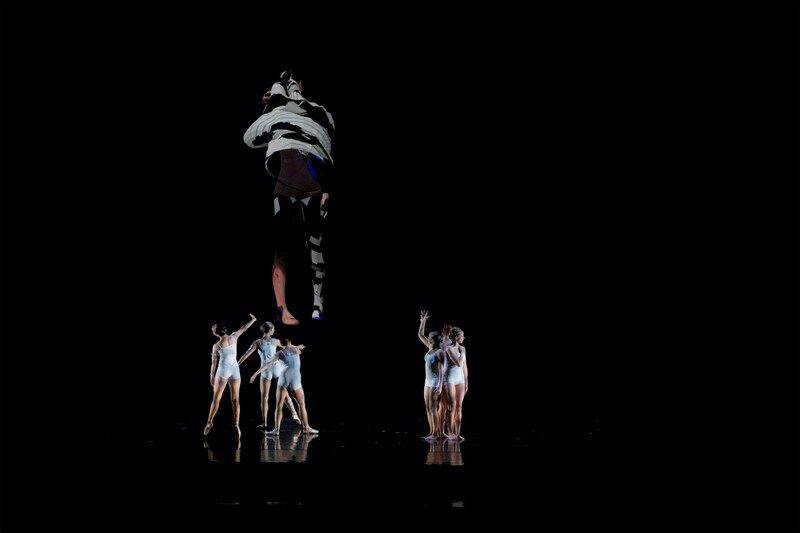 Phase I of the performance premiered at the Lied Center of Kansas in November 2013 with six dancers, and was later performed with four dancers in March of 2014 as part of the CURRENT SESSIONS in New York City. 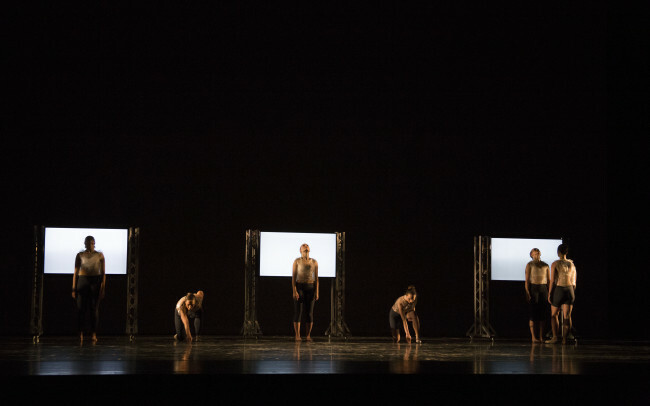 Phase II of the performance premiered with six dancers at the Lied Center of Kansas in November of 2014, and was the first phase to introduce the use of mobile monitors. 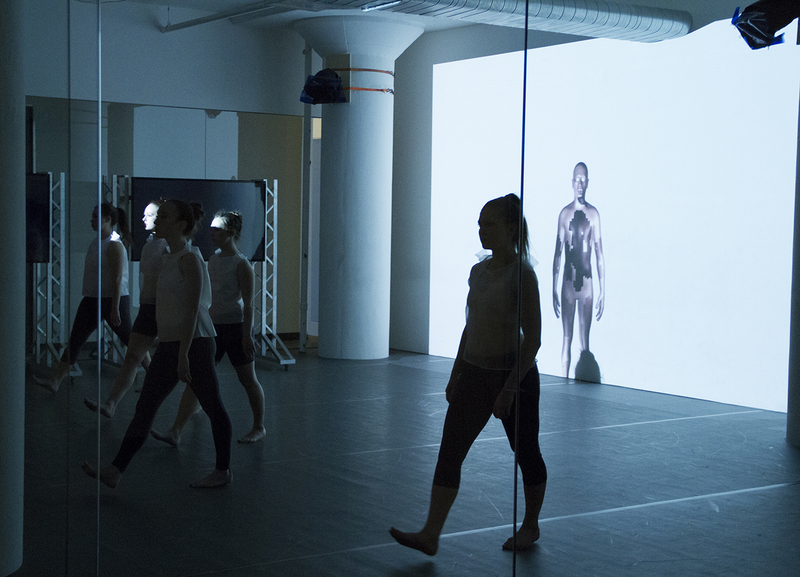 Phase III premiered in November of 2015 at the Lied Center of Kansas, and along with Phase II made its Chicago debut in April 2016 as part of “Body +/-” at High Concept Labs at Mana Contemporary. 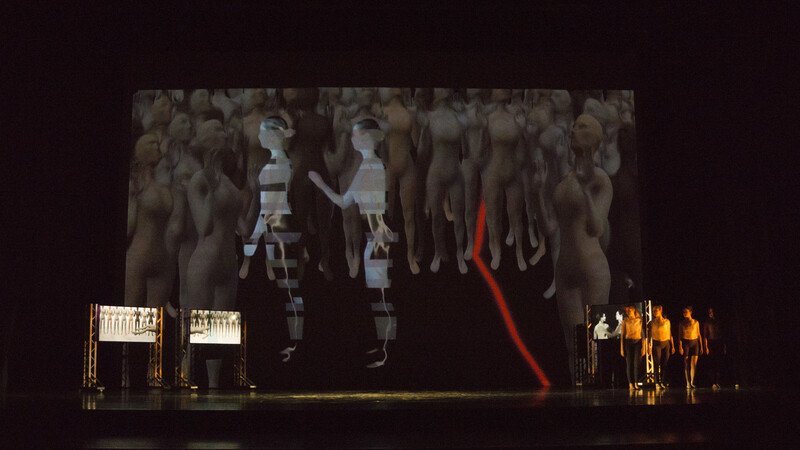 Virtual bodies appear on three wireless video monitors and the cyclorama. The dancers move, obstruct, and reconfigure the monitors as they compete with the digital bodies for control of the performance space. 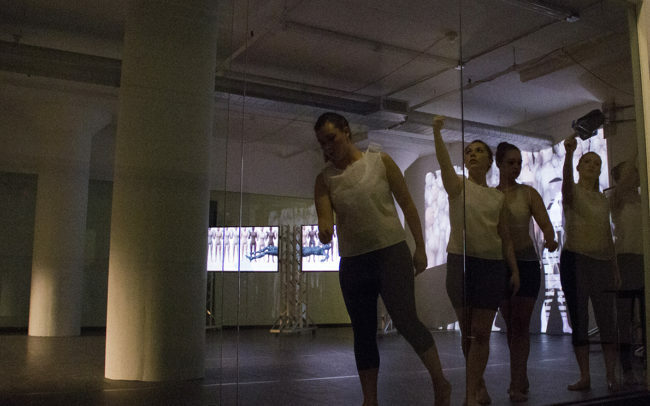 At other times, the dancers are under the temporal and spatial control of the digital bodies. 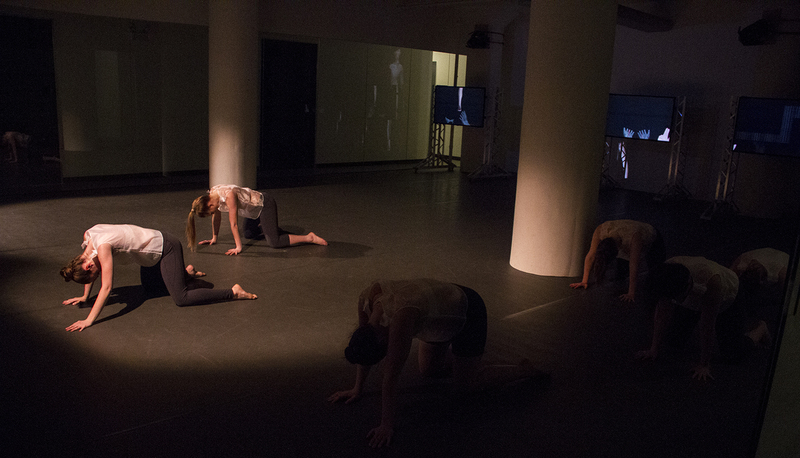 Over the course of the performance this shifting struggle for control reveals the complexity of designating the “human.” Over the course of the project, the dancer’s bodies are videotaped, at times scanned, and then manipulated, stretched, reformulated and interjected into different virtual scenarios on the cyclorama and mobile monitors that draw from the fields of video gaming, internet culture, and computer graphics. 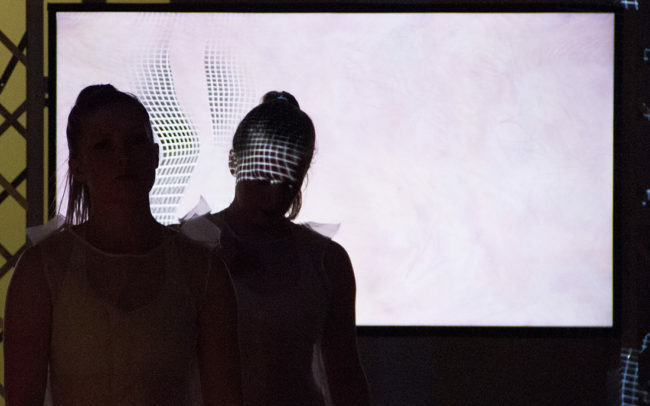 These bodies intersect with digital “stand-in” bodies that “wear” skins of constantly changing video textures, both mimicking physical experience and defying the limitations of that experience. 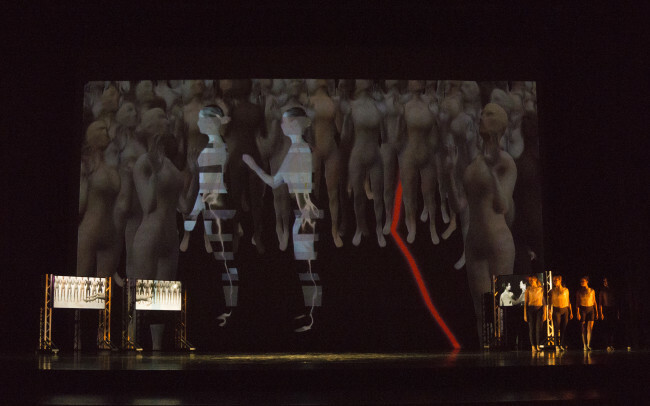 In Phase I of the performance the computer maintains the majority of control—the condition of both the virtual and physical bodies emphasized by the sound score. Primarily extracted from existing computer “system” sounds, the audio is chopped, stretched, manipulated and reoriented, making the audio an actor, or a body, in its own right Using rhythmic and temporal structures that, at times, collapse in exhaustion, the sound mimics the visceral condition of the dancers as they compete in an arena that tests their boundaries and limits. Phase II of the performance continues the conversations established in the first phase however, the sensibility of this phase stands in contrast to the highly systematized, computerized language of the first. 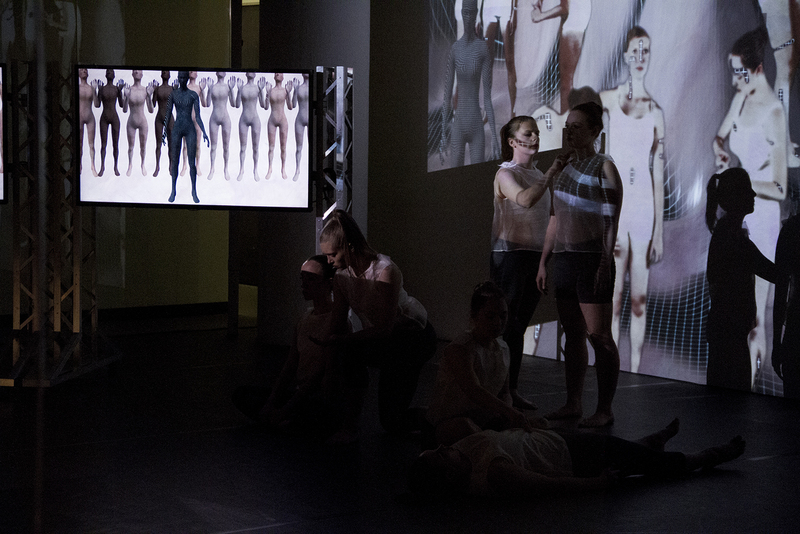 In this iteration the body is supreme—virtual bodies “play” real by wearing realistic skin textures and attempting to mimic at times the choreographic desires of the physical bodies (including material from the first phase). 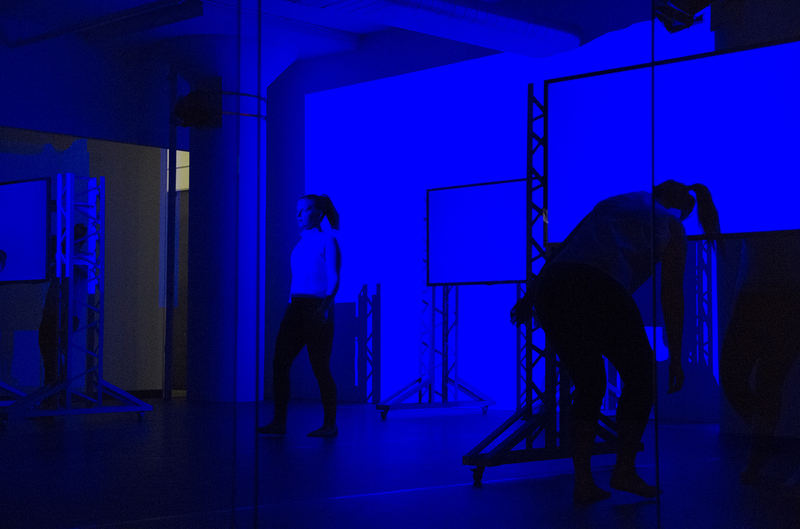 The choreography for this phase showcases the capabilities of the body, its strength and its fluid abilities, and its ability to direct the technology (via the movement of the monitors). 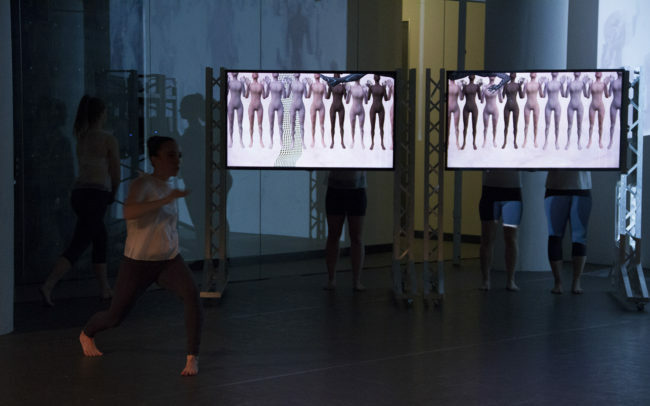 At the same time the dancers fetishize the technology, showcasing it, fusing with it, and competing with it (for example, being “run over” by the monitors). 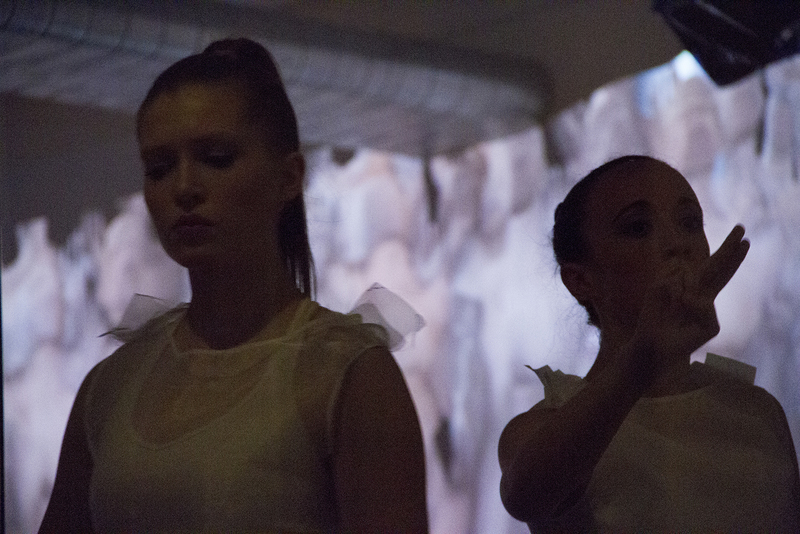 In Phase III of the performance, the virtual bodies and physical bodies become components of a somewhat malfunctioning and elaborate techno-breathing machine. 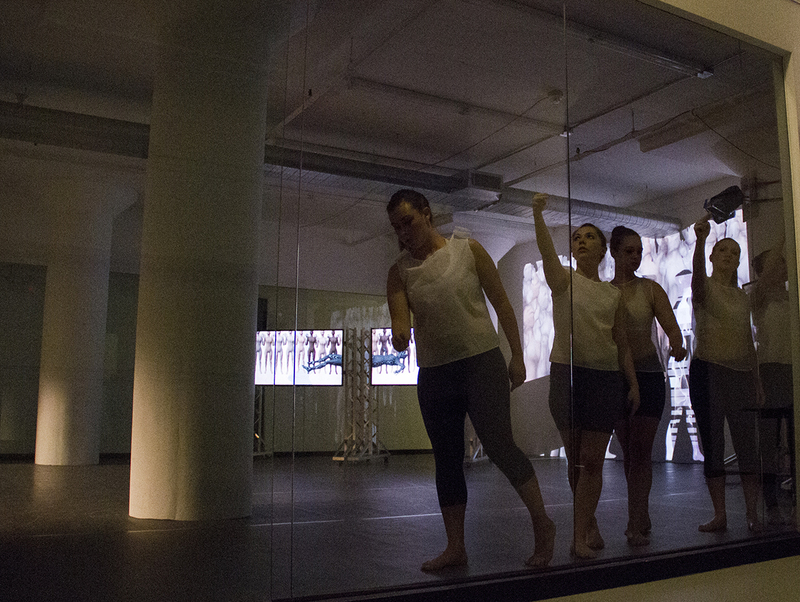 Directed by the motion of virtual hands and bodies on the monitors, the dancers attempt to become active participants in this system. Failing to perform at the level of the technology, the system collapses, reboots and reveals the underlying interdependency. Human, Next: Phase One, Human, Next: Phase Two and Human, Next: Phase Three —video reinterpretations of a live dance/video/animation work by choreographer James Moreno and artist Benjamin Rosenthal—explores the convergences and differences between virtual and physical bodies, offering new perspectives on our 21-st Century hybrid condition. 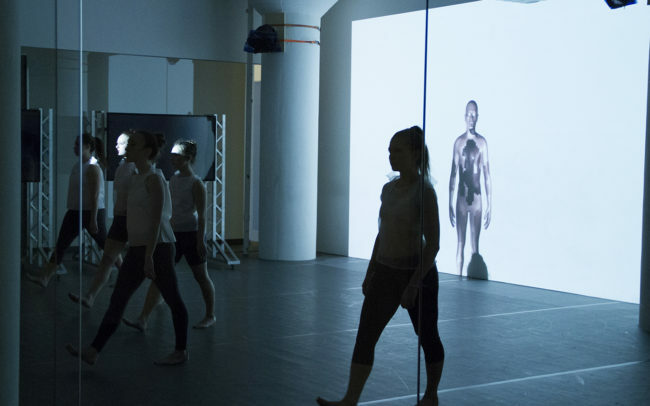 In Human, Next: Phase One, the systematized condition of both the virtual and physical bodies is further emphasized by the sound score, composed for the piece by Benjamin Rosenthal. Primarily extracted from existing computer “system” sounds, the audio is chopped, stretched, manipulated and reoriented, making the audio an actor, or a body, in its own right Using rhythmic and temporal structures that, at times, collapse in exhaustion, the sound mimics the visceral condition of the dancers as they compete in an arena that tests their boundaries and limits. 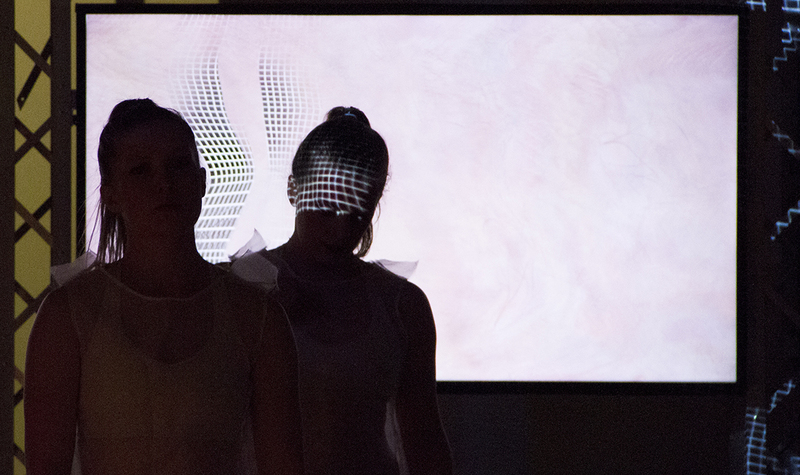 In contrast, Human, Next: Phase Two renders the physical body supreme—virtual bodies “play” real by wearing realistic skin textures and attempting to mimic the choreographic desires of the physical bodies. 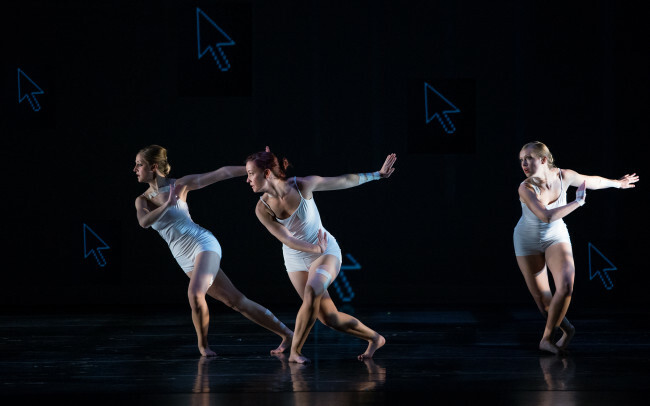 The choreography emphasizes the emphasizes the capabilities of the physical body and its ability to direct the technology, while at the same time the dancers fetishize the technology—showcasing it, fusing with it, and competing with it. The sound score for the phase emerges exclusively from sounds recorded by the body that have been recomposed, manipulated and processed. 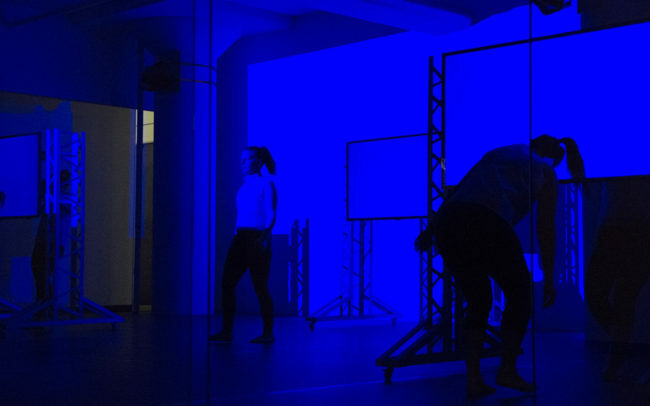 In this way the sound mimics the fusion of the body and machine as expressed in both the choreography and video content of the work. 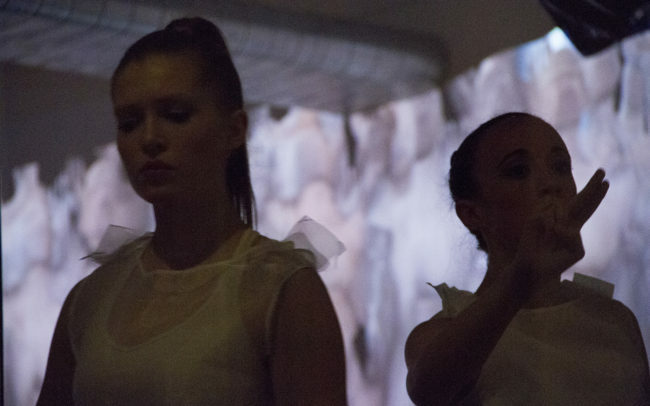 In Human, Next: Phase Three the bodies of the dancers become fused with the virtual bodies as part of an elaborate techno-breathing machine. Unable to perform at equal capacities and with synchronicity, the system collapses and reveals the underlying interdependency between the will of the physical bodies and the desires of the technological system.